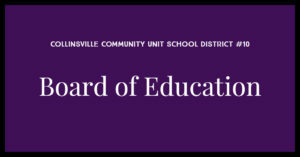 The Collinsville Community Unit School District #10 Board of Education is accepting applications to fill the vacancy resulting from the January 2019 resignation of Board Member Wayne White. The individual selected for this Board vacancy will serve on the School Board from the date of appointment until a new member is elected for this position at the April 2, 2019 consolidated election and seated as a member of the Board of Education.  Not have any interest directly or indirectly in any contract, work, or business of the school district or in the sale of any article to the school district. For questions or additional information, please contact Susan Frechman, (618) 346-6350, ext. 4233.